Readers who find this page helpful, may also wish to visit these pages. Exhibition SmartAwards that Leave No Mind Behind and reward every participant while educating all of us about art and life. Schools seldom have enough space to show things as professionally as it should be. I like to keep exhibit design and presentation very simple and very orderly, even when it too crowded. I want the viewers to notice the artwork—not fancy exhibition design, brightly colored mats, or some distracting exhibition idea. When I see an exhibit with colored mounts, decorative additions, or bizarre arrangements, it makes me feel that there was not much respect for the artwork itself. I avoid colored additions. I have never seen an art museum that used colored mats or mounts for artworks created on paper. I want to see the artwork. I want the exhibition to be so well designed that I do not notice the exhibit design more than the artwork itself. To arrange the artwork, we begin with the largest works and gradually add smaller works to complete the design of the exhibit. Sometimes works can be grouped attractively. We often lay it out on the floor to see how a group works before putting it up. The older students or more advanced classes do the work. When students learn how to design and install the exhibit they are learning art. They are learning very useful life-long choice-making skills and I am ultimately getting lots of help. They have to make choices about color relationships, dominance and subordinance, how to move the viewer's attention around, and all the standard compositional questions. I remind students to be particularly careful about the negative spaces between the works. I make the negative spaces (wall spaces, if any) equal unless there is a good visual reason not to make them equal. They have to make choices about color relationships, dominance and subordinance, how to move the viewer's attention around, and all the standard compositional questions. They are asked to be as fair as possible when they choose where to place their own work and that of their friends. See this link for ideas on mounting a display of school artwork where there is no good provision for an exhibit. 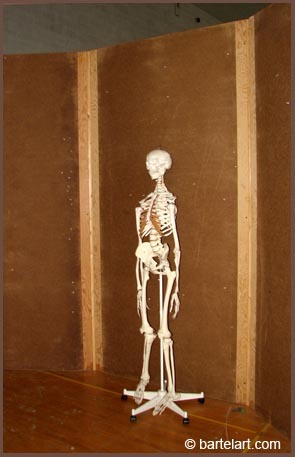 It illustrates a simple way to use tape to hang temporary exhibits so the work will not fall down, but can still be removed without damaging the wall after hanging a week or so. In April, 2006, I viewed an exhibit of the student work of art education students at the College of Creative Studies in Detroit. In addition to titles, artist name, and media, each work or group of artworks was displayed together with the assignment. By sharing the concepts used in the assignment the viewer participates in the learning. Our art programs get more of the support from parents, administrators, and other teachers when we help them see the learning benefits of art assignments. In addition to the student name, it is good to include title, media, and the name of the art class if it is high school work, or year in school if elementary or middle school. If there are several teachers, include the teacher's name as well. Some situations require a large overall title to the exhibit. Some exhibits are divided by categories, and it may be helpful to identify each category. In some schools, it is good to make some way-finding signs to guide the visitors to the room or place in the building where they can see the artwork. Giving awards has benefits and pitfalls. This page explains a way to gain motivational and education benefits from awards while avoiding the negative pitfalls (a teaching invention seen here first). No good place for an exhibition? How to Install an Exhibit using tape so it will not fall down. 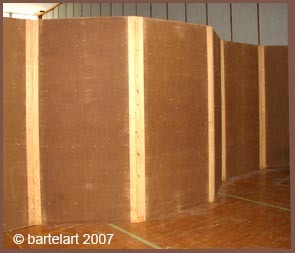 How to Build a Temporary Self-Supporting Wall in the Gym using Tackable Fiberboard. This space is used as a drawing room in an old gymnasium. Also see shop drawings below. The walls are used to tack up drawings during critique sessions. A similar wall can be used for exhibitions. Panels are available in different colors and with fabric cover for classroom use. Other products are also available at your building suppliers. Do not hide exit signs. 4 x 8 foot panels are attached to angle spleens with screws. tackable fiber panels to display artwork. Teachers may make one copy of the drawings for school use. Commercial or business use restricted without specific permission. CAUTION: Find a safe and spacious place to add walls. Do not hide exit signs. Do NOT restrict or block school corridors or add combustibles unless your fire marshall and insurance company approves. The author does not make any safety claims for the products illustrated on this page. Check the specs of the products before using them in a school setting. Parents and teachers may make one copy of this page for personal study so long as they keep the © information with the copy. Permission is required to make copies, publish, or to post on another web site. Please mention the URL or the title of this page in your correspondence with the author. You may make a link to this page from your page without permission. Your correspondence, experiences, ideas, and questions are welcome. More links with similar help for art teachers. nice looking school display of student artwork. So, why should we do it? 1. Children gain self esteem by seeing their work seen by others.2. Art is incomplete without an audience. 3. Children work harder on their artwork if they know it may be seen by all. 4. The display is a great place to post the assignment goals. This is good review and it helps parents and other teachers learn about the ways artistic thinking is learned. 5. Many parents take pride in seeing the work of their children. 6. Art teachers gain goodwill and sometimes it becomes easier to keep their jobs, get funds and donations for supplies when they provide work for the walls of the halls and offices in the school. 8. Artwork adds cultural value and identity to the school and the community. 9. A fair and equal representation of every child needs to be included. If not every child's work is every exhibit, a fair rotation system is employed. All of this is lots of work. I think it is good to enlist student assistants. Initially they need to be taught the design and assembly skills to design, prepare, and mount displays of student work. This is an appropriate part of any art curriculum. Older or more prepared students can then be assigned to supervise other students. When selecting work to include, it is important to treat all children equally. We should either display all the work or have a fair system of rotation that gives every child's work the same exposure.